Nicolas Poussin, The Plague of Ashdod, 1630. Oil on canvas, 148 x 198 cm. Musée du Louvre, Paris, France, Giraudon/Bridgeman Art Library. The word plague is believed to come from the Latin word plāga ("blow, wound") and plangere (“to strike, or to strike down”), via the German Plage (“infestation”). Plasmids of Y. pestis have been detected in archaeological samples of the teeth of seven Bronze Age individuals from 5000 years ago (3000 BC), in the Afanasievo culture in Siberia, the Corded Ware culture in Estonia, the Sintashta culture in Russia, the Unetice culture in Poland and the Andronovo culture in Siberia. Y. pestis existed over Eurasia during the Bronze Age. Estimates of the age of the Most recent common ancestor of all Y. pestis is estimated at 5,783 years Before Present. The Corded Ware culture, CWC comprises a broad archaeological horizon of Europe between c. 2900 BCE – circa 2350 BCE, thus from the late Neolithic, through the Copper Age, and ending in the early Bronze Age. Corded Ware culture encompassed a vast area, from the Rhine on the west to the Volga in the east, occupying parts of Northern Europe, Central Europe and Eastern Europe. In the second century, the Antonine Plague, named after Marcus Aurelius’ family name of Antoninus and also known as the Plague of Galen, who had first hand knowledge of the disease, may in fact have been smallpox. Galen was in Rome when it struck in 166 AD, and was also present in the winter of 168–69 during an outbreak among troops stationed at Aquileia; he had experience with the epidemic, referring to it as very long lasting, and describes its symptoms and his treatment of it, though his references are scattered and brief. According to Barthold Georg Niebuhr  "this pestilence must have raged with incredible fury; it carried off innumerable victims. The ancient world never recovered from the blow inflected upon it by the plague which visited it in the reign of M. Aurelius." The mortality rate of the plague was 7–10 percent; the outbreak in 165/6–168 would have caused approximately 3.5 to 5 million deaths. Otto Seek believes that over half the population of the empire perished. J. F. Gilliam believes that the Antonine plague probably caused more deaths than any other epidemic during the empire before the mid-3rd century. The Plague of Justinian in AD 541–542 is the first known attack on record, and marks the first firmly recorded pattern of bubonic plague. This disease is thought to have originated in China. It then spread to Africa from where the huge city of Constantinople imported massive amounts of grain, mostly from Egypt, to feed its citizens. The grain ships were the source of contagion for the city, with massive public granaries nurturing the rat and flea population. At its peak, Procopius said the plague was killing 10,000 people in Constantinople every day. The real number was more likely close to 5,000 a day. The plague ultimately killed perhaps 40% of the city's inhabitants, and then continued to kill up to a quarter of the human population of the eastern Mediterranean. "Der Doktor Schnabel von Rom" ("Doctor Beak of Rome"). The beak is a primitive gas mask, stuffed with substances (such as spices and herbs) thought to ward off the plague. From 1331 to 1351, the Black Death, a massive and deadly pandemic originating in China, spread along the Silk Road and swept through Asia, Europe and Africa. It may have reduced the world's population from 450 million to between 350 and 375 million. China lost around half of its population, from around 123 million to around 65 million; Europe around one third of its population, from about 75 million to about 50 million; and Africa approximately ​1⁄8 of its population, from around 80 million to 70 million (mortality rates tended to be correlated with population density so Africa, being less dense overall, had the lowest death rate). This makes the Black Death the largest death toll from any known non-viral epidemic. Although accurate statistical data does not exist, it is thought that 1.4 million died in England (​1⁄3 of England's 4.2 million people), while an even higher percentage of Italy's population was likely wiped out. On the other hand, north-eastern Germany, Bohemia, Poland and Hungary are believed to have suffered less, and there are no estimates available for Russia or the Balkans. It is conceivable that Russia may not have been as affected due to its very cold climate and large size, hence often less close contact with the contagion. 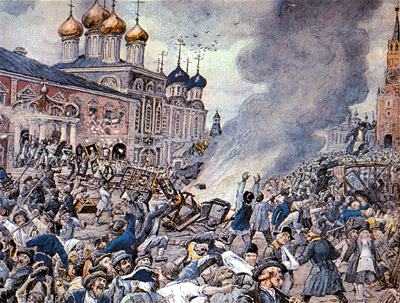 Plague Riot in Moscow in 1771: During the course of the city's plague, between 50,000 and 100,000 died (1/6 to 1/3 of its population). In the first half of the 17th century, the Great Plague of Milan claimed some 1.7 million victims in Italy, or about 14% of the population. In 1656, the plague killed about half of Naples' 300,000 inhabitants. More than 1.25 million deaths resulted from the extreme incidence of plague in 17th-century Spain. The plague of 1649 probably reduced the population of Seville by half. In 1709–1713, a plague epidemic that followed the Great Northern War (1700–1721, Sweden v. Russia and allies)  killed about 100,000 in Sweden,  and 300,000 in Prussia. The plague killed two-thirds of the inhabitants of Helsinki,  and claimed a third of Stockholm's population. Western Europe's last major epidemic occurred in 1720 in Marseilles,  in Central Europe the last major outbreaks happened during the plague during the Great Northern War, and in Eastern Europe during the Russian plague of 1770–72. On November 21, 2014 the World Health Organization reported  that there have been 40 deaths and 80 others infected on the island of Madagascar, with the first known case in the outbreak thought to have occurred in late August 2014. A combination of heavy monsoon rain and clogged sewers led to massive flooding which resulted in unhygienic conditions and a number of uncleared animal carcasses. It is believed that this situation precipitated the epidemic. There was widespread fear that the sudden rush of people from this area might spread the epidemic to other parts of India and the world, but that scenario was averted, probably as a result of effective public health response mounted by the Indian health authorities. Some countries, especially those in the nearby Gulf region, took the step of cancelling some flights and putting a pause on shipments from India. The Great Plague of Seville (1647–1652) was a massive outbreak of the disease in Spain that killed up to a quarter of Seville's population. The 1994 plague in India was an outbreak of bubonic and pneumonic plague in south-central and southwestern India from 26 August to 18 October 1994. 693 suspected cases and 56 deaths were reported from the five affected Indian states as well as the Union Territory of New Delhi. These cases were from Maharashtra, Gujarat, Karnataka, Uttar Pradesh, Madhya Pradesh and New Delhi. There are no reports of cases being imported to other countries. 1 2 "Plague". World Health Organization. October 2017. Retrieved 8 November 2017. 1 2 Frandsen, Karl-Erik (2009). The Last Plague in the Baltic Region. 1709–1713. Copenhagen. p. 13. ISBN 9788763507707. 1 2 Byrne, Joseph Patrick (2012). Encyclopedia of the Black Death. Santa Barbara (CA): ABC-CLIO. p. xxi. ISBN 9781598842531. ↑ Rasmussen, Simon; Allentoft, Morten Erik (2015). "Early Divergent Strains of Yersinia pestis in Eurasia 5,000 Years Ago". Cell. 163 (3): 571–82. doi:10.1016/j.cell.2015.10.009. ISSN 0092-8674. PMC 4644222 . PMID 26496604. ↑ Callaway, Ewen (2015). "Bronze Age skeletons were earliest plague victims". Nature. doi:10.1038/nature.2015.18633 . Retrieved 2015-10-27. ↑ Panagiotakopulu, Eva (2004). "Pharaonic Egypt and the origins of plague" (PDF). Journal of Biogeography. 31 (2): 269–75. doi:10.1046/j.0305-0270.2003.01009.x. ISSN 0305-0270. ↑ "Plague Prayers of Mursilis" Pritchard, J. B. 1969. Ancient Near Eastern Texts. Princeton: Princeton University Press. ↑ Kozloff, Arielle (2006). "Bubonic Plague in the Reign of Amenhotep III?". KMT. 17. ↑ Trevisanato SI (2007). "The biblical plague of the Philistines now has a name, tularemia". Med. Hypotheses . 69 (5): 1144–46. doi:10.1016/j.mehy.2007.02.036. PMID 17467189. ↑ I Samuel 5:6; "But the hand of Yahweh was heavy on them of Ashdod, and he destroyed them, and struck them with "sores"/"tumors"/"Hemorrhoids", even Ashdod and its borders." The LXX and Vulgate include "And mice multiplied in their land, and the terror of death was throughout the entire city." ↑ Freemon, F. R (2005). "Bubonic plague in the Book of Samuel". Journal of the Royal Society of Medicine. 98 (9): 436–36. doi:10.1258/jrsm.98.9.436. ISSN 0141-0768. PMC 1199652 . PMID 16140864. ↑ "Plague of Athens". Umm.edu. 2014-06-24. Retrieved 2014-08-24. ↑ Papagrigorakis, Manolis J.; Yapijakis, Christos; Synodinos, Philippos N.; Baziotopoulou-Valavani, Effie (2006). "DNA examination of ancient dental pulp incriminates typhoid fever as a probable cause of the Plague of Athens". International Journal of Infectious Diseases. 10 (3): 206–14. doi:10.1016/j.ijid.2005.09.001. PMID 16412683. ↑ Simpson, W. J. A Treatise on Plague. Cambridge, England: Cambridge University Press, 1905. ↑ Patrick, Adam. "Disease in Antiquity: Ancient Greece and Rome," in Diseases in Antiquity, editors: Don Brothwell and A. T. Sandison. Springfield, Illinois; Charles C. Thomas, 1967. 1 2 Wade, Nicholas (October 31, 2010). "Europe's Plagues Came From China, Study Finds". New York Times. Retrieved November 2, 2010. ↑ Procopius. History of the Wars, Books I and II (The Persian War). Trans. H. B. Dewing. Vol. 1. Cambridge: Loeb-Harvard UP, 1954.—Chapters XXII and XXIII of Book II (pp. 451–73) are Procopius's famous description of the Plague of Justinian. This includes the famous statistic of 10,000 people per day dying in Constantinople (p. 465). ↑ Bishop, Rebecca A. (2 December 2003). "The History of the Bubonic Plague". Graduate School of Biomedical Sciences. University of Texas Health Science Center at Houston. Archived from the original on 2007-01-13. ↑ "Scientists Identify Genes Critical to Transmission of Bubonic Plague". National Institute of Allergy and Infectious Diseases (NIAID). July 18, 1996. Archived from the original on 2010-03-08. ↑ Maugh, Thomas H. II (2002-05-06). "An Empire's Epidemic". Los Angeles Times. ISSN 0458-3035 . Retrieved 2016-10-20. ↑ "Justinian's Flea". Justiniansflea.com. Retrieved 2014-08-24. ↑ "The Great Arab Conquests". Archived from the original on 2009-02-02. ↑ "Black Death". Encyclopedia of Population. 1. Macmillan Reference. 2003. pp. 98–101. ISBN 978-0-02-865677-9. ↑ "Historical Estimates of World Population". Census.gov. US Census Bureau. Retrieved 2016-10-20. ↑ Stephen Porter (2009-04-19). The Great Plague. Amberley Publishing. p. 25. ISBN 978-1-84868-087-6. ↑ J. N. Hays (1998). The Burdens of Disease: Epidemics and Human Response in Western History. Rutgers University Press. p. 58. ISBN 978-0-8135-2528-0. ↑ J. N. Hays (2005-12-31). 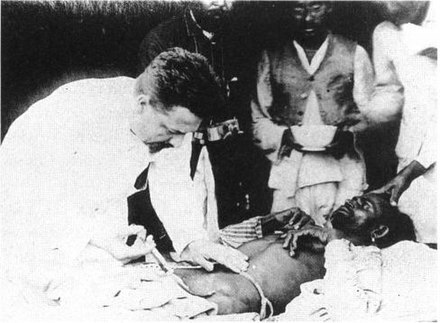 Epidemics And Pandemics: Their Impacts on Human History. ABC-CLIO. p. 46. ISBN 978-1-85109-658-9. ↑ Geoffrey Parker (2001-12-21). 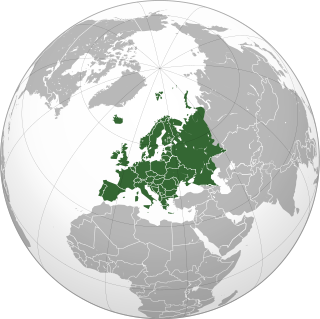 Europe in Crisis: 1598–1648. Wiley. p. 7. ISBN 978-0-631-22028-2. ↑ "BBC – History – Black Death". bbc.co.uk. BBC. Retrieved November 3, 2008. ↑ "Radio 4 Voices of the Powerless – 29 August 2002 Plague in Tudor and Stuart Britain". Bbc.co.uk. Retrieved November 3, 2008. ↑ Vanessa Harding (2002-06-20). The Dead and the Living in Paris and London, 1500–1670. Cambridge University Press. p. 25. ISBN 978-0-521-81126-2. ↑ Vanessa Harding (2002-06-20). The Dead and the Living in Paris and London, 1500-1670. Cambridge University Press. p. 24. ISBN 978-0-521-81126-2. ↑ Geography, climate, population, economy, society. J.P. Sommerville. ↑ Brian Pullan (2006-04-12). Crisis And Change in the Venetian Economy in the Sixteenth And Seventeenth Centuries. Taylor & Francis Group. p. 151. ISBN 978-0-415-37700-3. ↑ Mary Lindemann (1999). Medicine and Society in Early Modern Europe. Cambridge University Press. p. 41. ISBN 978-0-521-42354-0. 1 2 Harald Aastorp (2004-08-01). "Svartedauden enda verre enn antatt". Forskning.no. Retrieved January 3, 2009. ↑ Øivind Larsen. "DNMS.NO : Michael: 2005 : 03/2005 : Book review: Black Death and hard facts". Dnms.no. Retrieved November 3, 2008. ↑ "Naples in the 1600s". Faculty.ed.umuc.edu. Retrieved November 3, 2008. 1 2 R. S. Bray (2004-04-29). Armies of Pestilence: The Impact of Disease on History. James Clarke & Co. p. 72. ISBN 978-0-227-17240-7. ↑ "Kathy McDonough, Empire of Poland". Depts.washington.edu. Retrieved November 3, 2008. ↑ John T. Alexander (1980). Bubonic Plague in Early Modern Russia: Public Health and Urban Disaster. Oxford University Press. p. 21. ISBN 978-0-19-515818-2. ↑ "Ruttopuisto – Plague Park". Tabblo.com. Retrieved November 3, 2008. ↑ Tony Griffiths (2009-11-25). Stockholm: A Cultural History. Oxford University Press. p. 9. ISBN 978-0-19-538638-7. ↑ "The Islamic World to 1600: The Mongol Invasions (The Black Death)". Ucalgary.ca. Retrieved December 10, 2011. ↑ Robert C. Davis (2003-12-05). 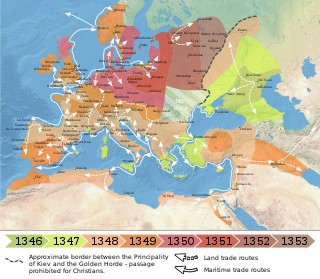 Christian Slaves, Muslim Masters: White Slavery in the Mediterranean, the Barbary Coast and Italy, 1500–1800. Palgrave Macmillan. p. 18. ISBN 978-0-333-71966-4. ↑ Charles Philip Issawi (1988). Fertile Crescent, 1800–1914: A Documentary Economic History. Oxford University Press. p. 99. ISBN 978-0-19-504951-0. ↑ Pryor, E.G. (1975). "The Great Plague of Hong Kong" (PDF). Journal of the Hong Kong Branch of the Royal Asiatic Society. 1975: 69. ↑ "Great Chinatown Fire". Starbulletin.com. 2000-01-24. Retrieved 2014-08-24. ↑ Wade, Nicholas (October 31, 2010). "Europe's Plagues Came From China, Study Finds". The New York Times. ↑ Mark Achtman (October 31, 2010). "Yersinia pestis genome sequencing identifies patterns of global phylogenetic diversity". Nature Genetics. 42 (12): 1140–43. doi:10.1038/ng.705. PMC 2999892 . PMID 21037571. ↑ "Plague Pneumonia – California". Centers for Disease Control and Prevention (CDC). August 31, 1984. Retrieved April 20, 2007. ↑ Boisier, Pascal; Rahalison, Lila; Rasolomaharo, Monique; Ratsitorahina, Maherisoa; Mahafaly, Mahafaly; Razafimahefa, Maminirana; Duplantier, Jean-Marc; Ratsifasoamanana, Lala; Chanteau, Suzanne (2002). "Epidemiologic Features of Four Successive Annual Outbreaks of Bubonic Plague in Mahajanga, Madagascar". Emerging Infectious Diseases. 8 (3): 311–16. doi:10.3201/eid0803.010250. PMC 2732468 . PMID 11927030. ↑ Madon MB, Hitchcock JC, Davis RM, Myers CM, Smith CR, Fritz CL, Emery KW, O'Rullian W (1997). "An overview of plague in the United States and a report of investigations of two human cases in Kern county, California, 1995". Journal of Vector Ecology. 22 (1): 77–82. PMID 9221742. ↑ "Oregon man suffering from the plague is in critical condition". Daily News. New York. 12 June 2012. ↑ ABC News (2012-07-19). "Oregon Man Survives Black Plague, to Lose Fingers, Toes". ABC News. ↑ "Plague Data in New Mexico". New Mexico Department of Health. Retrieved September 16, 2007. ↑ "The Couple that Caught Bubonic Plague from Infected Fleas — NOVA Next - PBS". Pbs.org. 5 June 2015. Retrieved 10 October 2017. 1 2 Stack, Liam (27 June 2017). "Plague Is Found in New Mexico. Again". Nytimes.com. Retrieved 10 October 2017. ↑ "Living And Loving Through The Bubonic Plague". Npr.org. Retrieved 10 October 2017. ↑ "Public health pandemics - Homeland Security News Wire". Homelandsecuritynewswire.com. Retrieved 10 October 2017. ↑ "Human Plague – Four States, 2006". Centers for Disease Control and Prevention (CDC). August 25, 2006. Retrieved April 13, 2007. ↑ "Campground Closes Because of Plague". KSL Newsradio. May 16, 2005. Retrieved December 15, 2006. ↑ "Cat tests positive for bubonic plague". The Arizona Republic. May 16, 2005. Retrieved December 15, 2006. 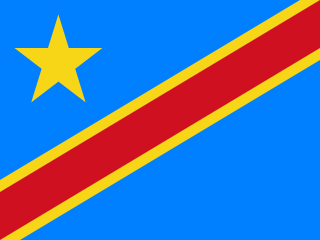 ↑ "Congo 'plague' leaves 100 dead". BBC News. June 14, 2006. Retrieved December 15, 2006. ↑ "Plague-Infected Mice Missing From N.J. Lab". ABC News. September 15, 2005. Retrieved December 15, 2006. ↑ "Denver zoo animal died of plague". News First Online. May 22, 2007. Retrieved May 23, 2007. ↑ "RSOE EDIS" . Retrieved June 8, 2007. ↑ Galvan, Astrid (November 9, 2007). "Grand Canyon National Biologist probably died of plague". The Arizona Republic. ↑ Maureen Oltrogge; Pamela Walls (November 9, 2007). "Plague is probable cause of death of National Park Service employee at Grand Canyon National Park". The National Park Service. 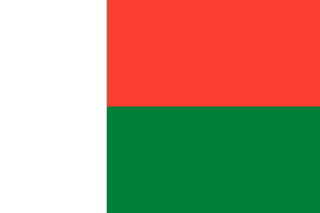 ↑ "Madagascar: eighteen dead from Bubonic Plague, five in hospital since 1 January 2008". Archived from the original on 2009-05-09. 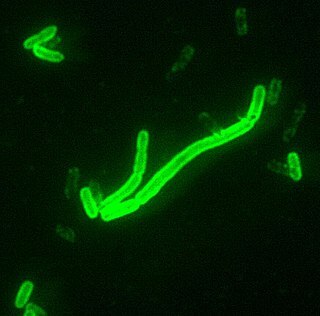 ↑ "WHO probes report of bubonic plague in Libyan town". Reuters. June 16, 2009. ↑ "Town quarantined as deadly pneumonic plague strikes in China". news.com.au. August 2, 2009. ↑ Randall, Tom (February 25, 2011). "Plague Death Came Within Hours, Spurred by Scientist's Medical Condition". Bloomberg. ↑ "Confirman otro caso de peste bubónica en Ascope". Peru Correo. Archived from the original on 2010-07-02. ↑ "Plague-infected ground squirrel found". May 3, 2012. ↑ Terry, Lynne (June 12, 2012). "Man likely sickened by plague in critical condition in Bend". Oregonian. ↑ "Plague-Infected Squirrel Closes California Campground - ABC News". Abcnews.go.com. 2013-07-26. Retrieved 2014-08-24. 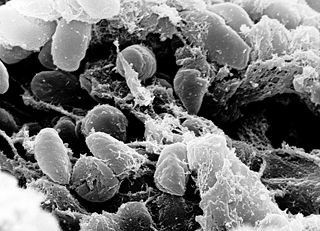 ↑ "Teenage boy died of bubonic plague in Kyrgyzstan". Xinhua News Agency. August 26, 2013. Retrieved August 26, 2013. ↑ Press, Associated (20 December 2013). "Bubonic plague outbreak kills 32 in Madagascar". Theguardian.com. Retrieved 10 October 2017. ↑ Maya Rodriguez (2014-07-13). "Colorado man diagnosed with the plague". Firstcoastnews.com. Retrieved 2014-08-24. ↑ "Chinese city sealed off after bubonic plague death". The Guardian. July 22, 2014. Retrieved July 22, 2014. ↑ "Madagascar plague outbreak kills 40, says WHO". BBC. 2014-11-21. Retrieved 2016-11-13. ↑ Associated Press; Samantha Wright (22 May 2015). "Plague In Idaho Ground Squirrels Prompts Health Warning". Boise State Public Radio. Retrieved 14 December 2016. An epidemiologist with the Central District Health Department ... says they’ve seen plague in ground squirrels southeast of Boise before, but this year it’s spreading fast. ... The outbreak should slow down once the ground squirrels go into summer hibernation in late June and early July. ... There's little officials can do to stop the outbreak in the meantime. Until then, officials are asking people and their pets to avoid the infected area. ↑ "Officials: Ground Squirrels In Southwestern Idaho Likely Have Plague". Boise State Public Radio. Associated Press. 27 May 2016. Retrieved 14 December 2016. ↑ Wright, Samantha (13 December 2016). "CDC Says Six Cats Diagnosed With Plague In Idaho This Summer". Boise State Public Radio. Retrieved 14 December 2016. ↑ "2 more plague cases reported in N.M.'s Santa Fe County". Detroitnews.com. Retrieved 10 October 2017. ↑ Roberts, Leslie (9 October 2017). "Deadly plague epidemic rages in Madagascar". Science . Retrieved 12 October 2017. 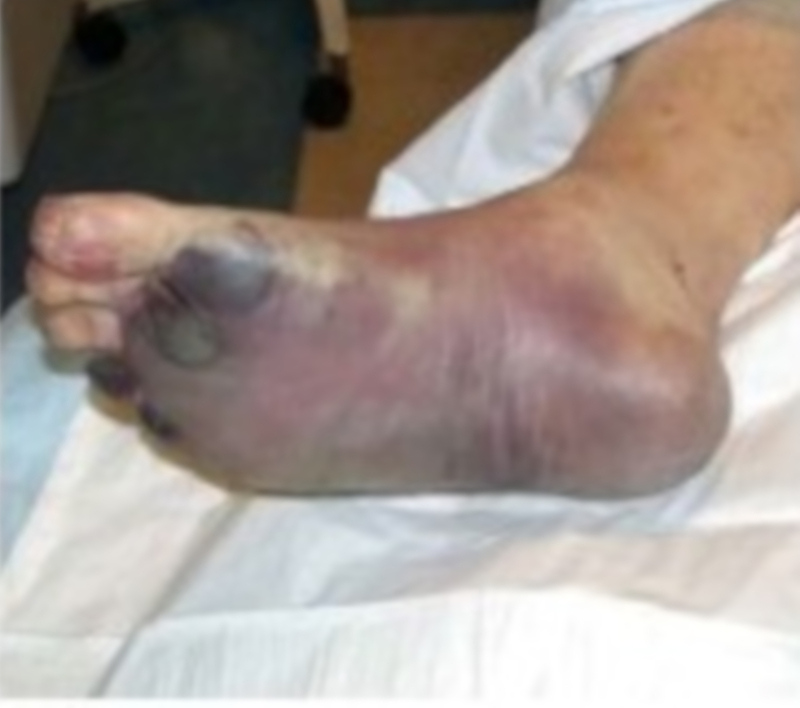 ↑ "Pneumonic Plague Epidemic in Sural". Association of American Geographers. Archived from the original on 2007-08-08. Retrieved April 26, 2008. ↑ "Surat: A Victim of Its Open Sewers". New York Times. September 25, 1994. Retrieved April 26, 2008. ↑ Burns, John F. (September 29, 1994). "With Old Skills and New, India Battles the Plague". New York Times. Retrieved April 26, 2008. 1 2 Hazarika, Sanjoy (March 14, 1995). "Plague's Origins A Mystery". New York Times. Retrieved April 26, 2008. ↑ "The Surat Plague and its Aftermath". Godshen Robert Pallipparambil. Retrieved April 26, 2008.